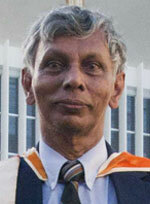 Professor J. Rohan Lucas is an Emeritus Professor of Electrical Engineering of the University of Moratuwa and an International Professional Engineer. He graduated with a BSc Engineering Honours degree from the University of Ceylon in Peradeniya and postgraduate degrees from the University of Manchester (UMIST). He has over 40 years of postdoctoral experience in teaching, research and professional experience, in Sri Lanka, United Kingdom, Canada and New Zealand. He has received many Research Excellence Awards from the University of Mortuwa. In recognition of his contributions, he has been bestowed the Teaching Excellence Award by the University of Moratuwa and the Engineering Excellence Award by the Institution of Engineers Sri Lanka in September 2013. He retired from formal employment on 31st March 2014 and has been honoured by the naming of the newly renovated Laboratory as the Rohan Lucas High Voltage Laboratory on his 70th birthday on 17th October 2017. He continues to serve society in various capacities, including academic (UoM and KDU) and as an Electrical Consultant. Copyright © 2019 - Prof.rohan.lucas.lk.